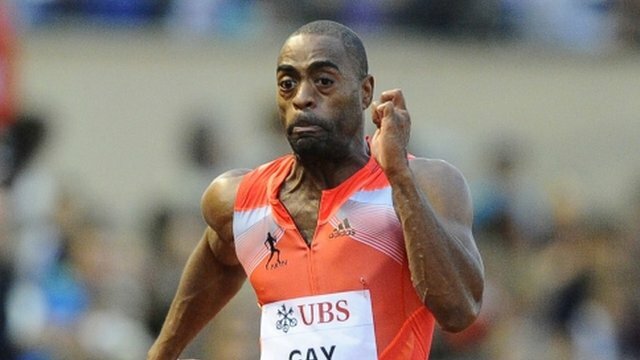 US sprinter Tyson Gay and Jamaica's former 100m world record holder Asafa Powell have failed drug tests. Powell tested positive for a banned stimulant while competing in June's Jamaican championships. Fellow Jamaican athlete Sherone Simpson also failed a drug test at the event. The sprinter, a 4x100m relay silver medallist at last year's London Olympics, tested positive for oxilofrine – the same stimulant Powell tested positive for. Powell and Simpson's doping positives come a month after Jamaican Olympic champion Veronica Campbell-Brown tested positive for a banned diuretic. The 30-year-old Powell was the last man to hold the individual 100m record before compatriot Usain Bolt broke it in 2008. He is still the fourth fastest man of all time. Powell later helped Jamaica to win 400m relay gold at the 2008 Olympics in Beijing. He has run 9.88 seconds this year, but failed to make the Jamaican team for next month's World Championships. "I want to be clear in saying to my family, friends and, most of all, my fans worldwide that I have never knowingly or wilfully taken any supplements or substances that break any rules," Powell said in a statement. "I am not now – nor have I ever been – a cheat." Gay, who is the fastest man in 2013, is waiting for the results of his 'B' sample. He has already withdrawn from next month's World Championships in Moscow. "I don't have a sabotage story… I basically put my trust in someone and was let down," he said. "I know exactly what went on, but I can't discuss it right now. "I hope I am able to run again, but I will take whatever punishment I get like a man." USADA responded to Gay's disclosure by releasing a statement that read: "In response to Mr Gay's statements, USADA appreciates his approach to handling this situation and his choice to voluntarily remove himself from competition while the full facts surrounding his test are evaluated. "The B sample will be processed shortly, and as in all cases all athletes are innocent unless or until proven otherwise through the established legal process, and any attempt to sensationalise or speculate is a disservice to due process, fair play, and to those who love clean sport." Gay, who missed almost a year of running after he had hip surgery in 2011, had been in impressive form so far this year, clocking the three fastest times of 2013. He won the 100m at the Jamaica Invitational athletics meeting in May with a time of 9.86 seconds, before clocking 9.75 seconds – the fastest time of 2013 – to win the US World Championships trials the following month. He continued his good form with victory in the men's 100m at the Diamond League meeting in Lausanne, running 9.79 seconds.